To Purchase 2019 Season Tickets click the Link below! To Purchase 2019 Flex Books click the Link below! Gift Certificates click the Link below! ​Help Support the Paul Bunyan Playhouse and The Historic Chief Theater ​Donate Today! 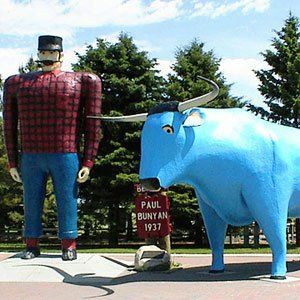 famous statues of Paul Bunyan and Babe the Blue Ox. The Chief Theater is owned and operated by the Paul Bunyan Playhouse, a 501(c) 3 tax exempt, fiscally responsible not-for-profit organization. All contributions are tax deductible to the full extent allowable by law. the Region 2 Arts Council through funding from the Minnesota State Legislature. The Chief Theater is owned and operated by the Paul Bunyan Playhouse, a 501(c) 3 tax exempt, fiscally responsible not-for-profit organization, managed by a volunteer Board of Directors and a professional staff. All contributions are tax deductible to the full extent allowable by law.